This brilliant rich blue flower captures the essence of a splash of water frozen in time. 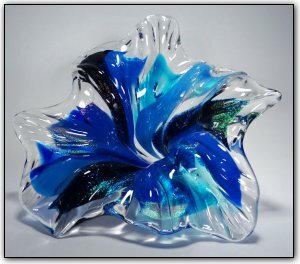 This flower is accented with dichroic glass all over to make it shimmer and sparkle in the light. Add elegance to any room with this beautiful hand sculpted work of art. The more light you shine on it, the more it sparkles!